Many of us have been on this path of awakening for several years or possibly a couple of decades. We have heard the discussions on how we need to recreate our thoughts so that our reality changes in what we truly desire. We have done the route of affirmations, visualizations, and fully seeing ourselves in a completely new way of Being. And it has worked after intense work. Once we understand that we must b lend the conscious, subconscious and superconscious minds to allow the I Am Presence to fully have control of our lives, then we can see how our actions form our past have molded our future. We are in an age now where the energetics of the Earth are so very strong that the tedious moments of writing affirmations for 21 days to break a habit are not always the easiest route to take. Please notice that it still helps to do these affirmations but with the higher energies surfacing upon the Earth, there are faster ways to combat the old thought processes. In order for us to Own our Personal Power it helps to understand how the three minds work separately and then in unsion. Personal Power is the guiding force of the healthy personality which is first an attitude. We can choose to hold either weakness or strength in each moment. Our power is the energy that we use to enforce our decisions. What if we are in a state of reflection in which those thoughts are not removed through the essence of feeling pure Love? Sometimes we need to understand how the whole process works before it works for us. The Non-Reasoning Mind also known as the Subconscious or Lower Self. Creates threads of energy that contact both objects and other people which can leave the body and follow those threads, i.e., pendulums, psychometry, psychokinesis). It can also sent vital force and thought forms along these threads as in telepathy and prayer. The subconscious mind can also be called the habit mind. It stores all our habits, both positive and negative. This is the level of consciousness we use when working with affirmations and why they are very important in our Personal Power awareness. It is also where the Law of Magnetism and Attraction operates as well as it continually attracts and repels things according to what has been programmed into it. It is very important to clear the subconscious of limiting beliefs as without doing so the Law of Attraction cannot work favorably towards us. Decision Maker in respect to Willpower, discipline, discernment, discrimination, concentration, reasoning. The Conscious Mind is the programmer, protector, and master of the Subconscious. The Subconscious is meant to be the servant of the conscious mind. Many people, not understanding the concept of the conscious and subconscious laws, let their subconscious mind run them, and thus, can become victims. Psychological health is the process of letting positive, spiritually balanced thoughts into our minds and is like physical health. If we want to be psychologically healthy, we put good, healthful thoughts into our minds. Also known as the Super Conscious Mind or Higher Self which can only help us if we ask for assistance and does not interfere with our free will on a conscious choice. In order to protect our subconscious minds, we need to protect ourselves on a daily basis. It is essential to have this protection when people criticize you, judging, and harsh statements. This can be like a bubble effect around our subconscious. Visualize a Bubble of Protection around the Subconscious Mind. This is separate from creating psychic protection. This is a shield from the thoughts that can bombard us. It is also a way to foster a positive attitude, and maintaining our personal power, unconditional self-love and self-worth, faith, and trust in God. Personal power or will is the guiding force of the healthy personality. It is first an attitude. Our power is the energy that we use to enforce our decision. It is also tied in with decisiveness. If one is not decisive, then the subconscious mind or other people will make your decision for you. The subconscious mind has not teachings or reasoning power so in retrospect others can overpower you if you do not take precautions to be empowered. Part of owning your personal power is being a spiritual warrior in your life. Never giving up and having the will to live is really possession the will to fight. When you use your power over an extended period of time, you develop discipline. When you don’t own your power, one can become depressed. Your power is your weapon with which to fight the negative and align yourself with the positive. The conscious reasoning mind, with the will or power, directs all the incoming forces. If you do not exercise this right, you can be overwhelmed. People in the extreme state of giving up their power, control, and mastery have become psychotic. Each morning, when you get up, claim your power by choosing to affirm the attitude in your mind that you possess it. Learn how to channel your lower emotions constructively, like anger. Saying and writing affirmations is essential, preferably 10 or more times daily for a total of 21 days. Claim your power and be the master in your life. Ask for the assistance of your Higher Self and I Am Presence. You can use this technique “I call upon my I Am Presence to illuminate my Path” See your pathway strewn with illumination of golden and silver hues. Then state explicitly of what you want your day to be like and affirm to yourself these thoughts. Utilizing all of these tools to blend the three minds will fully assist in the process. We are now in an age of full accessibility through the internet, videos, DVDs, CDs and performing ceremonies for ourselves or in a group setting. Energetics is truly our friend at this stage of our lives and will truly assist us in bringing forth the integration of our three minds. In fact, it is an essential component to assist in the process of accelerating our bodies to move to the 5th dimensional frequency. We need to incorporate the 22 Rays of God and the chakras and energetics is one very powerful source to actualize in this process. The following decree may be helpful to fully access the integration of the Three Minds. I Am fully empowered and discipline myself through the Subconscious Mind. My intuition is increased through my journaling and meditating daily. My dream state is activated by the Three Minds of my Subconscious, Conscious, and Super-Conscious fully integrated as One. I am now Fully Empowered Within. This is a meditation from my weekly Mastery Class. The first part of it is from Dr. Joshua David Stone, “50 Point Cleansing Meditation” with channeling energies interspersed within it. Now being in my current residence looking back on this trip is quite amazing to the inner discoveries. We can slowly look back through all of the photos and the blogs in where we traveled with each other, but separately our journeys are completely different. This also goes along with each of you. When I went to Mount Shasta, I had no idea the magnitude of love that I would receive. That trip was about my courage as a Warrior of Light and being able to walk along the trails of the forests, pathways of the waterfalls, and within the land of Mu to finally accept my destiny. 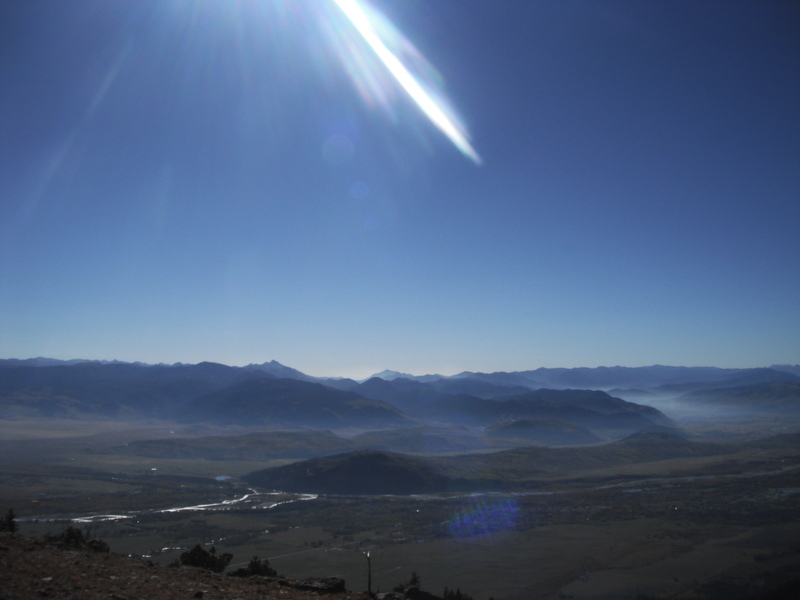 I previously had encountered many dark elements in Mount Shasta for the past ten years which helped to mold my shamanic pathway. This trip alone was for me to accept myself as a Master walking along the path. When Judy and I were told to travel towards the Tetons in January of this year, I did not have any idea of the whys and wherefores of the journey. I think that if we did, we would not forge ahead a new destiny within our lives. I feel this is true of each of us. If we truly knew the challenges we would have to face, we would not walk through those doorways. It is almost as if we are guided by our inner faith and know that the outcome is going to be a beautiful experience. What lies in between is truly the gift of initiation. Judy and I left the Teton Village about 8 a.m. on Friday morning. I don’t think we had packed so quickly from any other location. I felt it was time to leave the Tetons and take what we had learned. We were looking forward to our destination in Salt Lake City with the Jacuzzi and pool before our return flights across the country. Of course, we took a different direction towards Salt Lake City as that is what my GPS was telling us. Along this route we found out from a local mini-mart that it was the longer of the two. So we traveled amongst the plains, the mountains and the plains again across Wyoming, Idaho, and Utah several times. Evidently it is a route where you pass through the three states quite often. So here we were – sending out the light into all those lands, the animals, and all of creation. 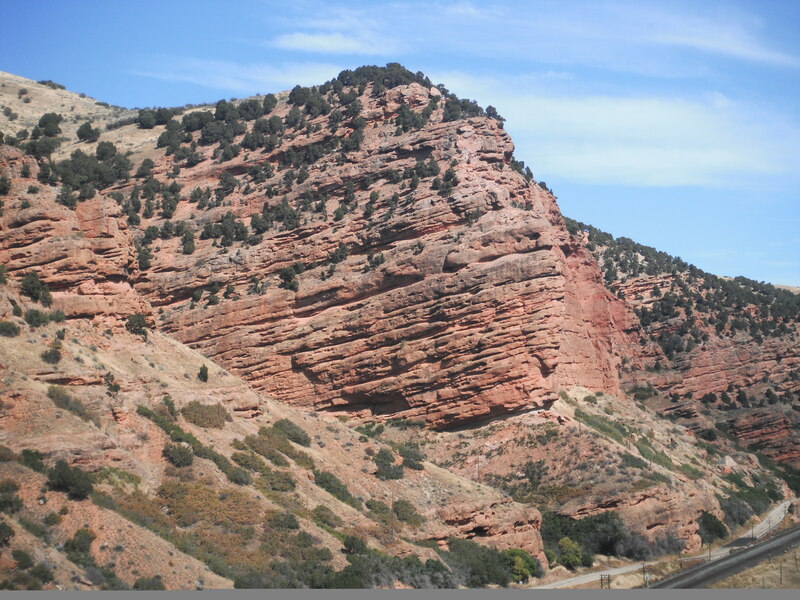 Once we started to get on a major highway towards Salt Lake City, we were introduced to the Red Rocks of Utah which I had no idea that they existed. It reminded us of the Sedona mountains. Getting into Salt Lake City and at our destination was quite confusing. I have never been in a city where the streets are all named with south, north, west and east. We finally did find our Holiday Inn Express which was very near the airport and in a business park. We settled in with our belongings and printed out our boarding passes. Much to our delight Judy was bumped up from Coach to First Class and then made a phone call for my seats. Luckily, there was a seat for me on both flights. The reward was sweet. We found a really nice sports bar and restaurant within two blocks. We enjoyed ourselves with a couple of margaritas and a very special dinner of Prime Rib. Now I normally do not eat beef but it tasted wonderful. My stomach handled it well, so I guess it was needed for grounding purposes. We went back to the hotel for our Jacuzzi experience which was such a delight after having no bathtub for a week. I love my baths with my essential oils and I was in my glory. I also swam in the pool for awhile then went upstairs to enjoy the tub and oils for all of my sore muscles. Judy was able to wash her clothes as she has a busy week ahead of her. We were out of the hotel on Saturday morning at 5 a.m. After I switched around my clothes in my luggage as I was able to check two bags under the first –class arrangement, and we found a gas station, we were on our way. Our first flight was to Phoenix with a two-hour layover. I sat next to a wonderful gentleman from New Zealand who was traveling to see his cousin in California. We had a great conversation on healing modalities, and higher consciousness thoughts. He showed me pictures of his home which were amazingly beautiful. Judy and I met up with one another from the airplane into the airport waiting for our luggage and then gave our goodbyes to each other. We are both changed and it will not be shown in our lives for a few weeks. Her life is quite different than mine but we both have great responsibilities within us and helping others. On my way back to my house on the airport van, I traveled with about eight soldiers who were going to Fort Dix, NJ. I thought it was interesting that I was on the same van as they were so took advantage of the situation by sending them the cosmic energies of protection. They were very involved with one another so conversation was minimal with them. As I departed out of the van, I said “Blessings to each of you. Thank you for doing what you do” and turned to look at each of them. They said thank you but I really felt the difference of energies from them to me. Today I am readjusting within me. I needed to buy some food so decided to travel down the road into the country a bit to a small farm market instead of going to the usually market. I cannot handle the tremendous energy yet. It was very grounding. My closing words are comprised of many thoughts. I am honored that I have been chosen in this way from the Masters to assist them on the Upper Earth. My journey has been very challenging as most of us, and many times I did not think I would survive the moments of darkness that were around me. I have been infused with so much love, light, joy, acceptance, trust, expectancy, miracles, and more love that it is hard to define it all. I know that I am here to reach out my hand to anyone who wants to follow this path. I will share my knowledge, my joys, my downfalls, and the expression of Oneness in whatever way it needs to be shown. My life is changed on the inside and I know it is now going to be shown in my outside world. I no longer have any doubts about anything in my life and am living in the moment even though outwardly I am not sure of anything. Thank you for being part of my world, my journeys, and allowing me to share my Light with all of you. Judy left for Yellowstone Park at 6 a.m. and I promptly fell back asleep. I wanted to be outside watching the sunrise but I guess I needed to be in the retreat for a while longer. 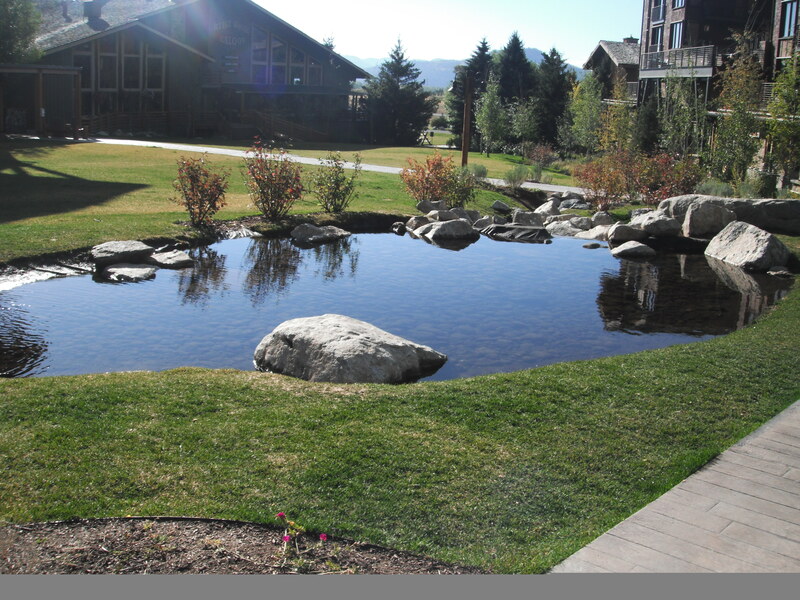 Sleep is so challenging here in the Grand Tetons especially with our accommodations. I finally was out and about at 10 a.m., picked up some coffee, and sat outside in the Teton Village facing the mountain where the ski lifts and Tram take visitors and skiers to the top. The village is a very nice place. Most of the lodging except for the Hostel are very expensive but there are lots of neat restaurants with dining on the decks overlooking the mountain. It is a beautiful view. I went up on the Tram as I wanted to connect with the energies privately. It had turned very windy so it was extremely cold. I walked down the path where we had hiked two days before. I felt that I needed to be on the right side of the mountain overlooking the other peaks and not facing the town of Jackson Hole. I found an area with rocks and grass so I sat for awhile connecting with the energies of the Mountain Retreat, Masters Confucius and Lanto, Ascended Master Saint Germain and the Native energies. I called upon the Spirit Keeper and as I did so, I started to see across the peaks astrally many masters standing around me. It was a magnificent feeling to be honored by so many. It was so very cold that I decided I needed to find another space to settle into for awhile. I picked up my backpack and moved back down to our original spot of two days ago with the medicine wheel still intact. I opened up the energies once again and asked the ascension columns to be energized in each of the directions of the East, South, West, and North. I called upon the Spirit of the Wind to please assist with less wind around me and Grandfather Sun to beam his light upon me. As I sat down in the middle of the wheel, everything became so very still. The wind died down, the sun was beaming brightly warming me up, and there was nothing but complete silence as I sat with the energies of the God Force in Spirit and in the Land. I connected with Saint Germain and he told me that they were honored that I had traveled this far to assist in bringing forth the Cosmic Energies. Master Confucius explained to me that the energies of Mt. 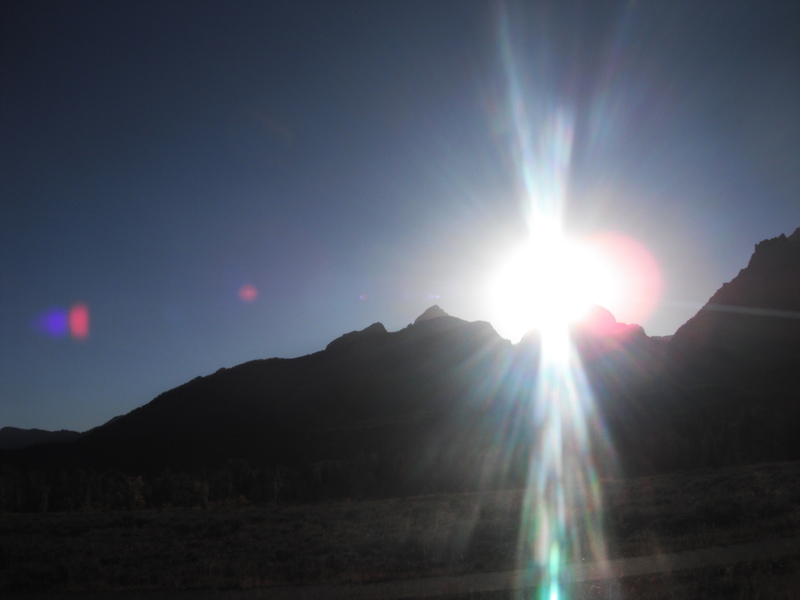 Shasta represent Lemurian energies and the Grand Tetons represent all levels of Universal consciousness as in Planetary, Solar, Galactic, Universal, Multi-Universal, and Cosmic. They told me that I assisted in bringing forth the Cosmic energies upon the land by bringing forth the 22 Rays of God in each of the ceremonies. The lands are walked by many individuals and most do not honor in the way we had done this week. They were in awe of our moments in the forests and connecting to the lands as we had done. They honored me in a way that I cannot explain what it felt like. I have been working on this path for over two decades and have gone through so many challenges that I never in my wildest dreams would be honored by so many in this way. I sat in my circle crying in joy and excitement for my soul and spirit. I have traveled far to come to this place of existence, and I could not deny the intensity of the Light I was receiving. At the same time, I was shaking from the wind and the cold but knew I had to endure the weather conditions. I was with them and I was within my body at the same time. I felt Master Babaji very intensely as he has been a very private teacher of mine especially on the subject of silence. He has taught me how to just be within myself for hours at a time. I felt his acceptance greatly in this moment of gratitude. Saint Germain also explained to me that the retreat was open for me to join them when they meet periodically. I know this is very private amongst the ascended masters so I was so very honored. They also asked me to do a tele-call on the full moon each month connecting individuals to the energies of the retreat. They are opening up the doorway for others to transform themselves and acquire the wisdom that is within their souls. I will be sending out information on these calls. As I sat there, I just connected with each of them. There were so many on each of the cliffs waving at me and I felt I had come “home.” To so many I know the death experience of leaving the body is going home but this was my home. I had found my place of acceptance, love, truth, wisdom, and illumination. Many may not understand this, but my world has always been so much a part of the Spirit World, and now I am bringing that fully within my physical existence. I am honored that I can bring this forth within me fully to share with so many. Saint Germain then told me it was time for me to leave the mountain. I cleaned up my things and closed off the energies. I gave my farewell to the mountain and all its inhabitants. As I walked back up the path which is very steep, I felt lighter and much different. Great changes have been integrated within me. Just as I was coming up the mountain, Judy sent me a text telling me she would be arriving very shortly. We decided to meet at the Moose Restaurant in the village. Both of us shared our experiences. 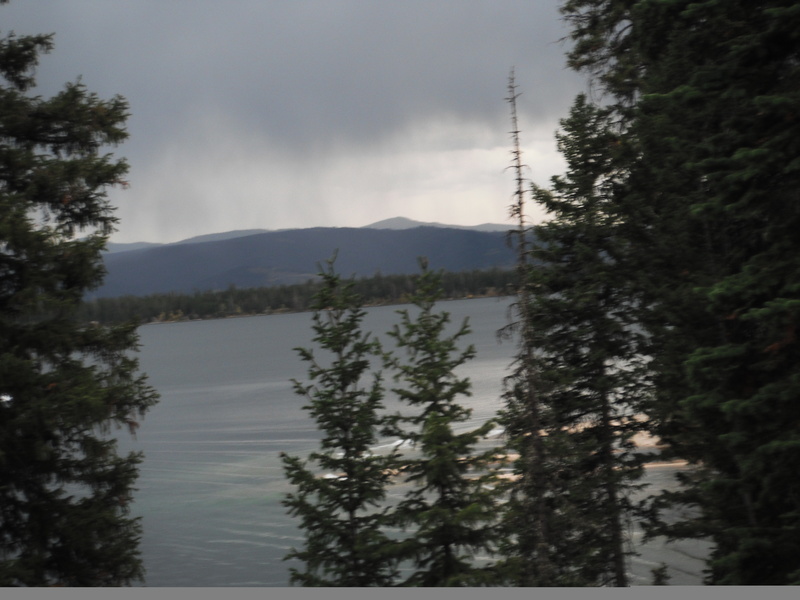 She was excited that she took the trip as this journey was about her sending healing into the land at Yellowstone Park, and her connection there. I was extremely out of sync and needed to readjust my energies before we did the closing ceremony. Judy decided she wanted to go up to the top of the mountain one more time to give her respects. I went back to our room, showered as the intensity was flowing through my body and was trying to become grounded with it all. To be aligned with the Ascended Masters is not something that I ever thought would happen to me in a physical body. It was overwhelming just feeling the love pouring into me. I spent some time communicating with Saint Germain, and he gave me more personal instruction of my newly opened pathway. I started feeling like I was coming back to Earth. Judy came back and we decided to drive to Jenny Lake one more time to do the closing ceremony. We went to the original spot from Monday, earlier in the week when we met up with the energies of the deer. 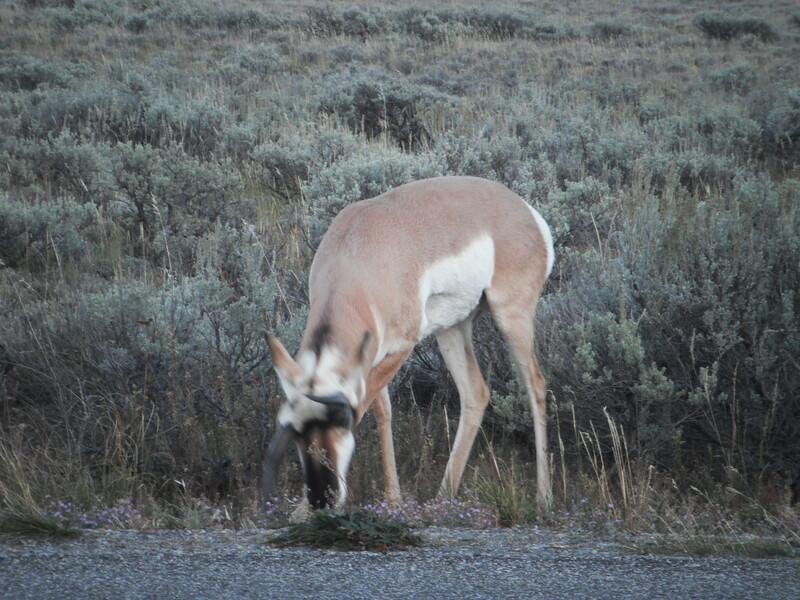 We drove through the National Forest and were putting our intentions out to see some wild animals as it was about 5 p.m. They come out of the forest for feeding time. Well, it is amazing when you put your wishes out there and you receive more than you could ever hope to create. As we were driving, some people were on the side of the road which is a very good sign. We stopped and saw that there was an Elk walking through the field about 200 yards away. We were able to take some pictures and the energies were amazing. It was also fun to meet new people along the way. Many individuals have amazing cameras with ipods and the works. They are there just for the photos. 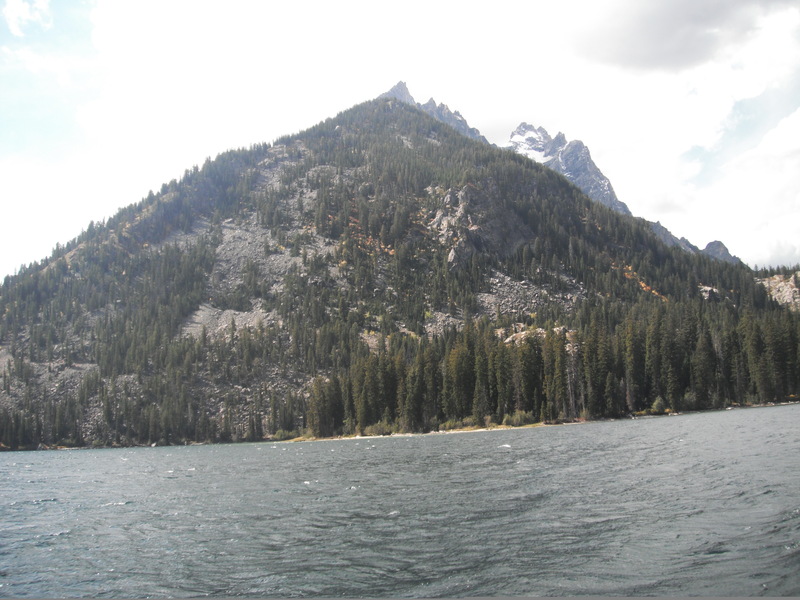 We then traveled through the rest of the park to get to Jenny Lake. We were just in time for the sunset behind the Teton Cathedral Mountains. We stood watching the sun coming down, asked for the closing energies of our journey this week including each of you that joined us for this magnificent pathway. It was very cold so we did not stay very long. As we were driving back towards the forest, we met an Antelope on the side of the road and then going into the forest, the excitement all came flowing towards us. Cars parked in all different ways on a road that is not very wide to begin with. A ranger was standing assisting the people. We were passing some cars and then right near me about 25 yards was this bear in a tree gathering berries. These animals are only concerned about getting their food even though people are everywhere with cameras. I did catch a shot but you will notice it is blurry. We think it was our energies as several shots were taken. 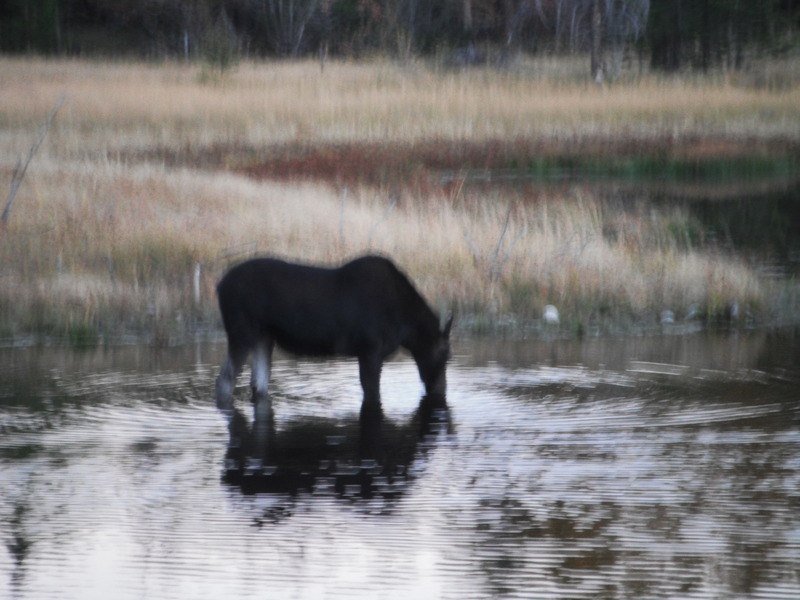 I then noticed a moose on the other side grazing in the field drinking from a pool of water. Judy jumps out of the car, and is looking into the field when she turns and sees some bushes moving. She runs back to the car screaming “that’s a bear”. It was only about 20 feet away. Of course, she went back and I was sending the protective energies because I think she is getting too close but she was insistent. She got her shots and then walked a few yards into the open field with some other people to get a shot of the moose. She came back to the car so very excited as she had asked to see a moose, an elk, and a bear. She received more than she could ever imagine. 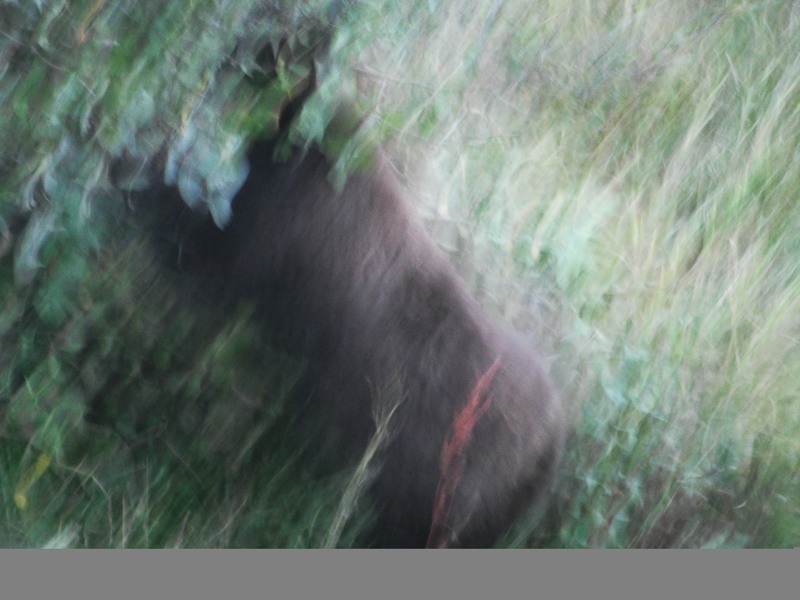 There was another bear to our right as we drove out, but they are very hard to see. They have a way of hiding and meshing right in with the bushes and trees. We had our last meal at an amazing Italian restaurant called, “Calico”. Our waiter was even from the Pennsylvania area near us. He traveled there for the skiing and never left. Now that is being in the moment, and doing what your heart desires. It has been the most amazing journey for both of us and I feel the same for others that connected with us. This was not just about me and Judy but all of us opening our pathways. It is time for us to aspire to what our souls came here to do and I am honored that I can be a “way-shower” for others to do so. Tomorrow we travel back to Salt Lake City and fly back to the East on Saturday. There will be one more blog before our journey comes to a close. This is truly an opening of many doorways for each of us. Thank you for being with me during this amazing time of awakening. Today started pretty scattered. I had a personal detail to take care of and could not get on the website, then my cell phone was dead and could not make the phone call needed. So I decided, ‘what the heck’. Enjoy the sunrise and get some coffee. Unfortunately, there is nothing open here until 7:30 a.m. I find that very interesting since this seems to be an action-type of environment and people are up and about early. 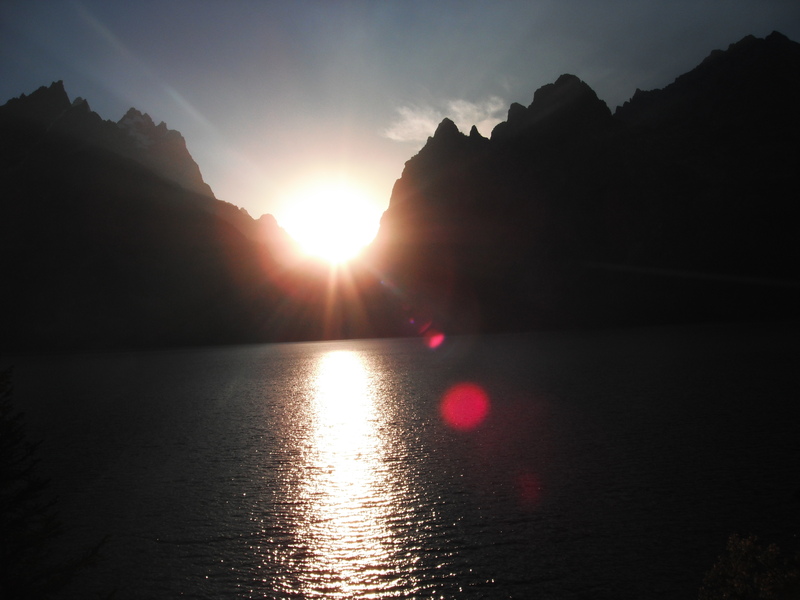 I walked around the village, took pictures of the sunrise, and breathed very deeply giving gratitude of my moments here in the Tetons. All that being said, we drove to a great breakfast café called the “Bunnery” in which we were able to get wholesome foods and internet connection. I was able to make some progress of my personal issue and will resolve the rest when I return. Then we were off to Jenny Lake again ~ this time to hike to Hidden Falls. We arrived at the Jenny Falls Visitor Center and walked towards the boat dock. The boat takes you from the south end of the lake to the north end where the falls are located. On the way off the boat, our mastery of ceremonies on the boat offered to me walking sticks to borrow. I promptly put in my wooden walking stick and started upwards. As Judy and I were going up the pathway, we were laughing as there were remembrances of another path we took in Mt. Shasta about three years ago which was full of rocks and very narrow. The path was so very steep and I was so happy I had the walking sticks to pull myself up the rocks that looked like steps. Thank heavens for all those core workouts and being at the gym the last year. The views were spectacular. Many people were on the path so the interactions were quite interesting. Of course, we are always looking to see which ones could be Masters in disguise coming by to say hello. One gentlemen was very tall, with long while hair and he was so happy coming up the path looking at Judy and I saying, “Isn’t this great? Smiling all the way.” What beautiful energy and I immediately thought of Archangel Michael as he had a T-shirt with New York written across it. It felt right since AA Michael is the leader of the Temple of 911. 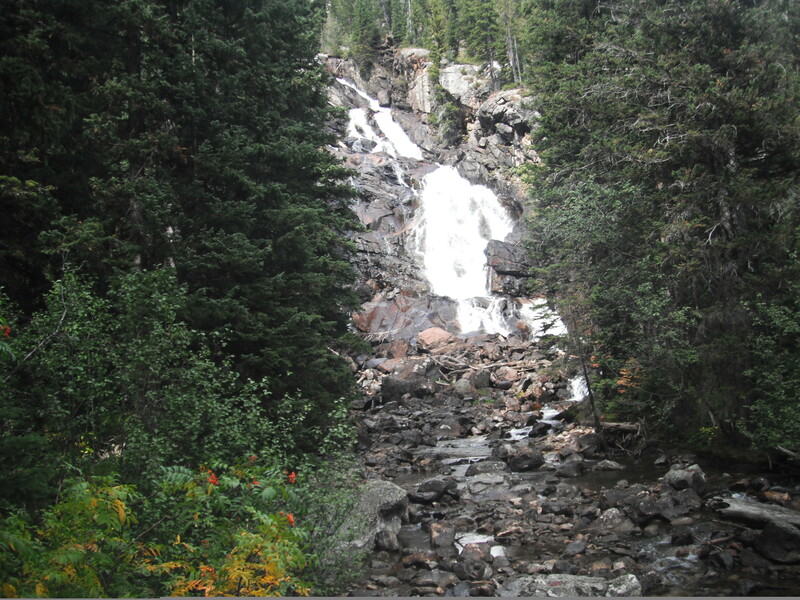 We stopped and took many pictures as we could see the falls to our left as we were hiking upwards. It is .6 tenths of a mile so it seemed like it was taking awhile. We had to walk across a bridge and then it started to rain very lightly. I felt it was cleansing our spirits. I knew it would not last long. So onward and upward we trekked. We finally arrived at the spot. You walk to a dead end which is roped off with benches to sit and look directly at the falls coming down the mountain. It was very worth the climb and the energies. Judy and I could not decide where to do the ceremony so I received a message from the Native energies to just bring it in very quietly right there. We asked for the 22 Rays of God and we both stated “I AM”. We then made a decision to go back down and see if there was another spot we could do the work. 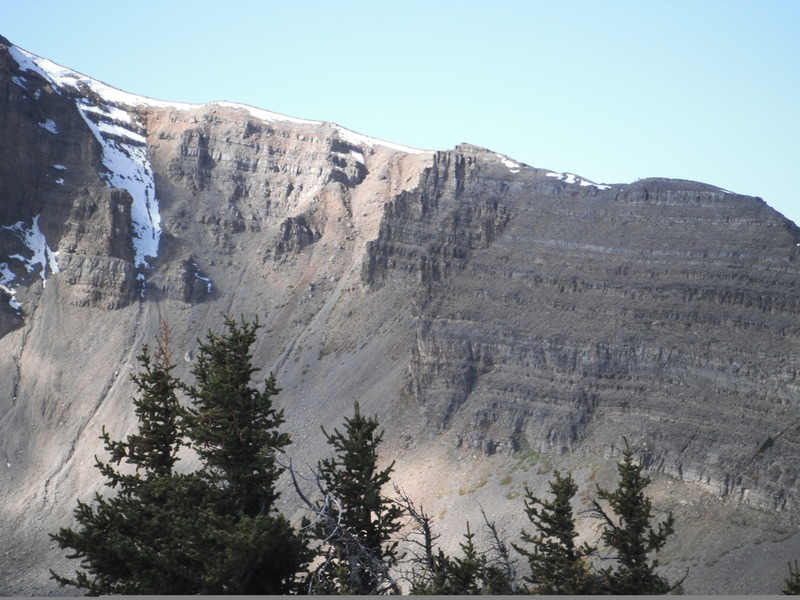 We had intended to continue to Inspiration Point which was up farther but we found out that it was much steeper and very rocky along with the view not being that spectacular. Since we were there to do a ceremony we decided that we would hike back down. We did find a wonderful spot to our left that had an alcove and a log for us to sit upon. We made a make-shift Medicine Wheel around the log bringing for the native energies along with the ascension energies. It was very powerful. We even had a gentleman walk around the wheel and not through it which was a wonderful improvement. We were honored by many messages in this moment that this trip was so powerful because the Grand Tetons represented all levels of creation from Planetary, Solar, Galactic, Universal, Multi-Universal, and Cosmic. Chief Seattle came through for us to thank us and said that no one has done this kind of work on the land to create the Earth energies along with the Cosmic energies incorporated by the 22 Rays of God. He said it is bringing forth the energies from the Mountain Retreat to the land masses and will assist greatly. I also asked for the healing energies to go out to a 500-mile radius. We did not have much time so we continued down the path back to the lake. We were very connected to many of the people and realized that many masters were watching us whether in body or in Spirit. One such gentleman caught our eye. He kept taking pictures of the trees by hanging out on cliffs. His energy was very Merlin-like so we called him Merlin. The last boat leaves at 4 p.m. and it was about 3:15 p.m. It started thundering so both Judy and I myself asked for assistance from the Thunderbeings for protection as the boat would not be able to take us back into the lightning and thunder. We arrived at the dock about five minutes before it was ready to leave. Always in the 11th hour; that is our style. I put back the walking sticks and someone had used my wooden walking stick. It turns out I did not need it today so I was happy someone else could use it. Back across the beautiful lake we traveled to where our car was parked. On the way there we encountered several Ravens which represent Magic so Judy and I were trying to get some pictures. She took an amazing one which I will share later. Back through the National Forest and into the woods we went. We were hoping to see a bear sighting since it was getting dark due to the weather conditions. We saw many cars parked on the side of the road with individuals being their crazy selves but not sighting for us. We found a nice Bistro to have dinner with a light meal of salad. Judy had decided to go to Yellowstone Park and I did not have an interest to be in that area. 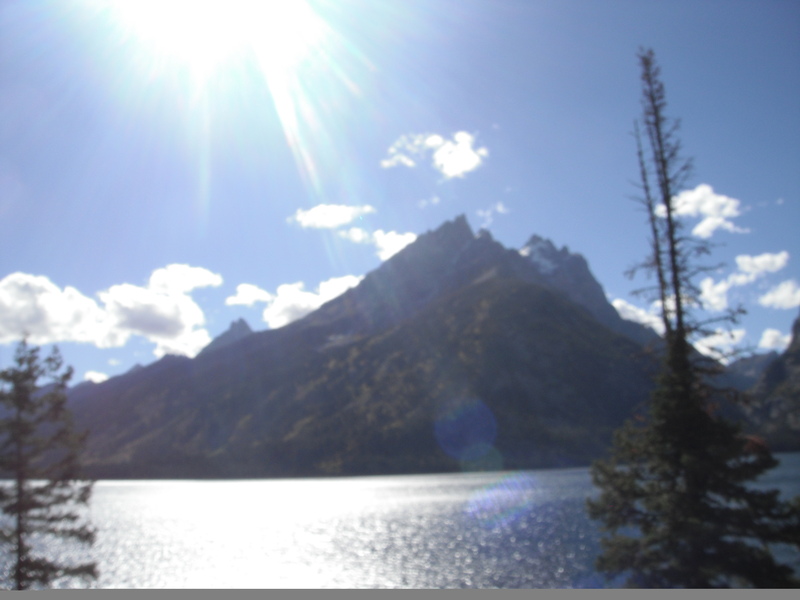 I felt my work was here in the Tetons with the retreat energies. So I offered her my prayers, and the information on the 22 Rays of God along with the information on bringing in the Native Energies for a medicine wheel along with the Ascension Energies. It was a poignant moment for me as Judy first came to me as a student for the Ascension work and here she was going to a strange place to create her own healing circle. It was so representative of what this journey has been about ~ others learning their wisdom and bringing illumination to the Earth. Tomorrow I am going up to the mountain alone as I need to integrate energies from this week and connect with the Ascended Masters alone. This trip has been so representative of each of us moving into our new pathway. We were up early and about so we could pick up the ride for the TRAM to go up the mountain directly from where we are staying at Teton Village. The ride takes 12 minutes very slowly and is a magnificent view. Once we arrived at the top which is 10,000 feet we did the usually with the pictures and then found our way down the mountain pathway to find a location for our ceremony. We walked about ½ mile and the trek down was steep so all I could think of was the walk back up. Really being in the moment, huh???? We found a clearing behind some trees facing the southwest direction. We then set up a medicine wheel with the rocks representing the four major directions of the East, South, West, and North with a large rock in the middle representing the Great Spirit. We used smaller rocks to represent the Southeast, Southwest, Northwest and Northeaster directions along with filling up to create a complete circle. We walked three passes outside of the circle to create, energize and make the circle sacred along with calling upon each of the aspects of all live in the Oneness of Creation. For each of the directions I added an extra energy by asking the Spiritual Hierarchy to create ascension columns in the four major directions and a Golden White Ascension energy for the center stone. We were ready but I was not prepared for people coming into our area and walking through the medicine wheel. I was trying to be patient but it is a sacred circle. I realized that it was representative of how we are living presently. As our vibrations raise upwards, we still have to interact with the lower forms of energy of the third and fourth dimensional realities. 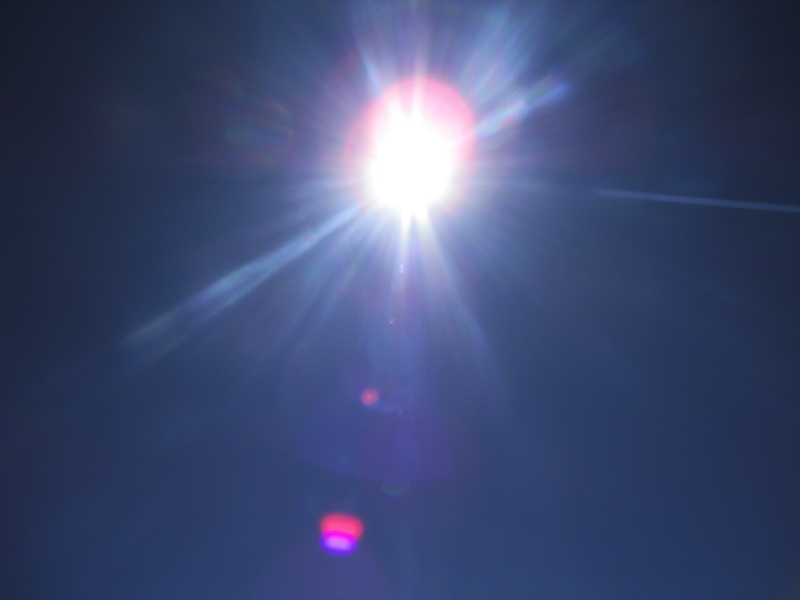 We called upon the 22 Rays of God to assist us in bringing forth healing to the land and within ourselves. Judy and I each stated our intention for this ceremony and moment. I also included everyone that was interested in being part of this ceremony. At this time, I could hear there was an Eagle to my left, in the Eastern direction. He was talking to us several times. I felt it was a great blessing. As we were sitting there, we saw in Etheric form, many masters rallying around the circle on the outside. I then envisioned St. Germain, Master Confucius on his right, and then Master Lanto on his left. They blessed us with their presence and then I channeled a meditation for us to visit the Mountain Retreat. We were gathered together in a beautiful Merkabah vehicle which encased all the beautiful colors of the rays, blues, violets, greens, reds, pink, lavender, yellow, gold, platinum, etc. We then were guided to the top of the Teton Peak and the vehicle went in front of the entrance. There were large heavy doorways that were opened. We were then guided to go down a crystalline tubular structure in which we went deep into the core of the earth. We were guided into a room where many masters were honoring our presence. Judy and I were then each guided to a different part of the temple where we conversed with specific masters for our personal mission. This is where anyone who joined us would receive the lessons that would be pertinent to their own pathway. After several moments, we were guided to step into the Merkabah once again to return to our original place of physicality. We then closed up the energies and I asked the ascension columns to be sent down to the core of the earth. I asked that the healing of the earth would compensate a 500-mile radius. It was then time for us to trek back up the mountain and take the TRAM back down. As we were walking up, we saw the Eagle flying around us. We tried to take a picture but he was so quick. He was pure black with white wings ~another gift being given to us. We took time to eat and relax for awhile. My energies were completely out of whack and I was not grounded at all. 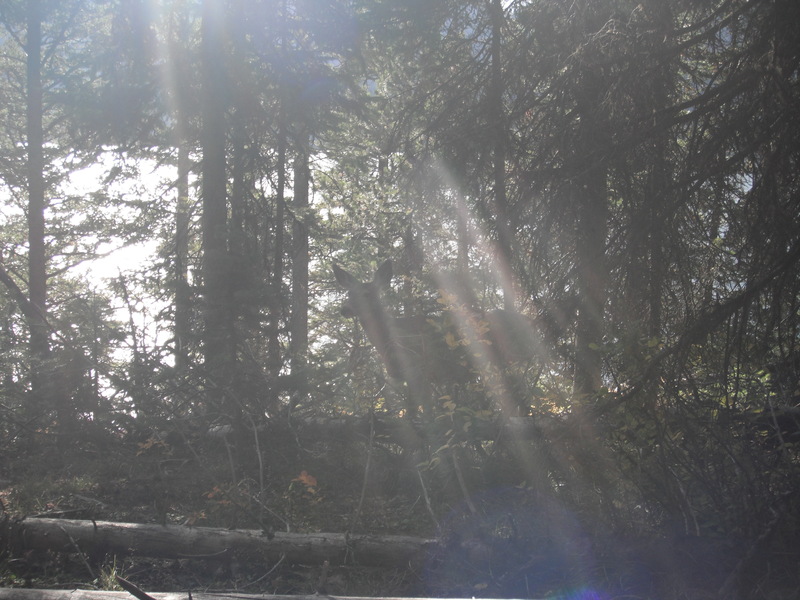 St. Germain gave me the message that we should travel to Leigh Lake as there were two people there waiting for us. Of course, we did as we were asked and I even took a quick 10 rejuvenation nap. Leigh Lake is an extension of the south part of Jenny Lake so we had to walk about a mile through the woods. 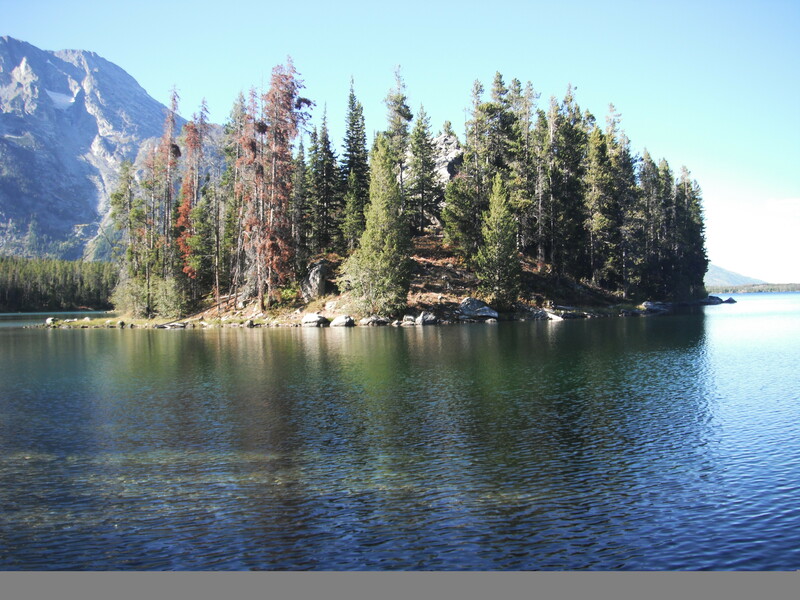 The lakes are amazingly beautiful and Leigh Lake is a left-over glacier. As I am walking, I am very uneasy. There is that fear of the Bear energy. I know that I am always protected but there are signs everywhere that they are very active in that area. We met some interesting people along the way and took amazing pictures. It was late in the day so the sun’s rays coming through the woods were amazing. The pathway was wide and pretty flat so it was not a hard hike. We finally reached our destination. We could see the lake in the distance and then you walk down a flight of steps to get to the base. It was so beautiful. Judy decided she needed to cleanse herself so she disrobed. We both had two pair of light pants on with layers of T-shirts. She went to her base and fully emerged herself in the waters. Now it was freezing, believe me but so refreshing. I decided I wanted to do the same but would wait until we got back to Jenny Lake as it was right near the parking lot and I would not have to walk in wet clothes. Our energies changed greatly. We did meet two people several times so I think they were all important connections. I was asking St. Germain about the reason we needed to take this hike and his first answer was, walking through my fear and finding our strength. I know what my lesson was and I am sure Judy knows hers. Possibly some of you may be going through the same things. He also told me there was a surprise for us. As we were about ½ mile back, we passed two individuals on horses. We were right next to them and the first one was golden. I mentioned to the rider, “how beautiful they are, and what a gift to receive.” I was in tears as the horse looked me deeply in the eyes and I was moved beyond what I could ever receive. Thank you for the “Power and Strength”. It was then my turn to dive into the freezing waters. So I did the same as Judy stripping down to my exercise pants and T shirt. The water was refreshing but freezing. It was actually very exhilarating…I laid on my back and dunked my head three times for cleansing and purity. I jumped out very quickly and it was interesting – not a soul around so I was able to change my clothes. It’s so nice to be in the woods….Remembrance of my childhood. We got back to the car and started our drive back into town. We were discussing the gentleman we met and I then realized it was my father. There were several clues. He had the same built, my father tapped dance and was a “song and dance man” in his time, he was born in Wisconsin and had the same built. He also wore funky floppy hats. I realized he was there as a thank you for the Masters. My father has ascended greatly in five years and he was a 32nd degree Mason. I then asked him and he said it was him. He was asked to meet with us as a act of gratitude of the journey we have been on. I was in awe that we were acknowledged in this way. We found a place to eat very late and I am writing this on Wednesday morning as I was so tired last evening. Internet is not very good here so not sure when the blog will get posted. 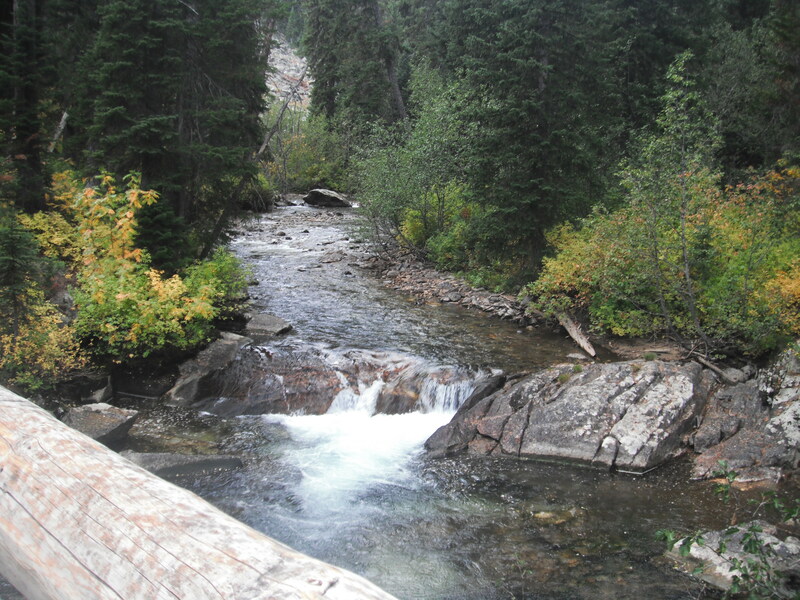 Today we are off to take a boat ride at Jenny Lake to go hiking to a waterfall and Inspiration Point. We both believe this is the entry point to the retreat. So much to take in and experience on all levels. Thank you for being here with me. How do I start? Today was a mixture of shifting gears and being totally in each moment. Last night was difficult sleeping. I felt so many energies around me that it was challenging to relax the body. At the same time, Judy was having tremendous stomach issues which is not unusual when we travel on these trips. We both awoke at 7 am feeling as if we had not rested. The quad room beds were not meant for middle aged women with any kind of back issues. We then promptly went back upstairs and moved our belongings from one room to the other. Luckily, it was on the same floor. We did our usual clearing but this room was so much better. Wow…what a difference. It has a small table with a lamp and some atmosphere that is not cold. It was a challenge but we got through it. We then decided we would take the TRAM as planned but wanted to get some breakfast first. Now at this time, it is 11 a.m. and the morning seemed to be flying by. Right next door is an amazing hotel with a nice café on the side. We took our time and had a healthy breakfast. At this point, I am feeling really off center. The coffee was not agreeing with me and then my energies were down spiraling. I knew I could not get on that Tram and hike on the mountain today. Way too much. So Judy and I sat down and both intuitively made a decision. We would not do the Tram on this day but would drive towards Jenny Lake through the State Park. It was the best decision we could have made. The drive was spectacular and about eight miles was through deep forest. We could not believe the amount of people that were on the road and this is after the summer season. Wow…! We came to a point where several cars were stopped on the side of the road and you could not pass. One car was even blocking the opposite lane. We both figured it was a bear and every piece of literature tells you “Do not get out of the car if you see a bear or even pull over to the side of the road.” They are very aggressive and looking for food. I felt like I was in a movie as people truly wanted to just see the bear like he was in a zoo. I was disheartened. Judy decided to get out as she wanted to make sure what the craziness was about. She came back and said there was a black bear in the middle of the road on all fours, not knowing which way to go. He seemed confused with everyone around him. I immediately put out my energies to give him some compassion through his own process. We traveled on our way. The directions were not clear how to get to Jenny Lake so here we are driving to the end of the forest and the main highway appeared. We did not think it was right so we turned around and ended up taking a wrong turn onto a very rocky road. We realized after almost a mile that it was not going anywhere. We then are confused about which way to turn. I guess it was the same for the bear. Interesting how we were mirroring each other. We finally saw two hikers and asked for their help and they guided us back to the original position in which we turned around ~ again, the intuition. We then saw there was another check point for the State Park. It does cost to drive through these areas but it is so very well worth it. I happened to find a site on the map called, “Chapel of Transfiguration” and we found the area. We stopped to enjoy the chapel which was absolutely amazing. We happened to meet a family that had been traveling from Pennsylvania which was ironic. In the chapel the energy of Sananda/Jeshua was so very strong. As I sat in the first row, tears rolled down my eyes, as I felt our own transfiguration occurring for each individual that is part of this journey. The energy was so very powerful and moving within the heart center. There was also a walking path through a village that once was thriving during the 1950’s and we strolled through the General Store and saw some amazing artifacts. Then we were on our way to Jennie Lake. We first stopped by a Visitor Center but it was packed with people. Hundreds of cars and campers everywhere so we decided to drive the scenic route along the lake. We finally found an overlook which was also very crowded but it was so amazing. There was a spot to walk down to the water but the incline was deep and it was crowded so we decided to look for another spot. Before we did so, a beautiful Raven came flying in front of us and perched himself on a branch of a tree overlooking the lake. He stayed there for quite some time which is so unusually for ravens. The message definitely was that the magic was about to enfold. We truly were looking to connect once again with the energies of the land. After some deliberation, we found a spot down the pathway a few hundred yards so we would not be bothered by anyone else. We walked into the brush facing the lake. “In the name of my mighty victorious I AM Presence I call on the beloved Cosmic Being Victory, beloved Ascended Lady Master Leto, and the beloved Sponsor of the Ascended Master Retreat, Master Confucius, of the Mountain Retreat. I then channeled information from both Masters Confucius and Lanto with an added special treat from Lord Sananda. They honored us with their presence, explained about our own pathways, and how we would be helping others. This also included each one of you who are part of this journey with us. Just as I was finishing the energies, Judy heard someone on the path behind us motion to her to come up as there was something on the pathway. As Judy went up to the path, I looked over to my right in the woods and there was a beautiful deer munching on some greens. She seemed very content to feel our energies. I walked on the path and this couple was with Judy with everyone taking pictures. There were two babies on my left in the brush and then two others that were a bit larger besides the one that I had originally seen. It was an amazing site. Each of us taking pictures and they were looking straight in our eyes. They were very happy to be with us. I was standing there in tears as the love in the woods and around us was so amazing. I have spent a lot of time in the woods growing up and never have I seen deer stay that close to human contact. We were definitely in Oneness together. The couple moved ahead but the deer were still there and then one-by-one they came out onto the path and pranced up around the bend. The original one to our right, now, was trying to get onto the path but kept looking at us. We realized that we needed to step back as our energies were stopping her from moving ahead with the others. It definitely was a moment in time and truly a gift from Spirit. We drove back to town, had some dinner and returned to our new lodgings. On the way into the parking lot, a fox crossed our pathway. Hmmm, camouflage…another interesting message. It truly was a day filled with wonderful realizations, magic, and love enfolding all around us. Tomorrow is another day and we were given the message that “be prepared, now it is coming.” I now have to rest and allow this weary body to fully relax. Until tomorrow..may you have many blessings of magic in each moment. Well, it has been an amazing two days of traveling. We arrived in Salt Lake City about 2 pm Mountain Time. We decided to rent a Toyota Prius as we are getting about 50 miles per gallon which has been advantageous for the gas. We have driven almost 400 miles and only at half a tank. It is like a “Merkabah” spaceship. Very cool…. We stayed in a town called Pocatello in Idaho last evening which was very relaxing as we were able to get into the Jacuzzi and pool after dinner. Sleep was not a problem after traveling about 12 hours between the air and the car. This morning was wonderful. We took our time which is unusual and got on our way about 11 am. The drive was amazing and we still had about 140 miles to travel. 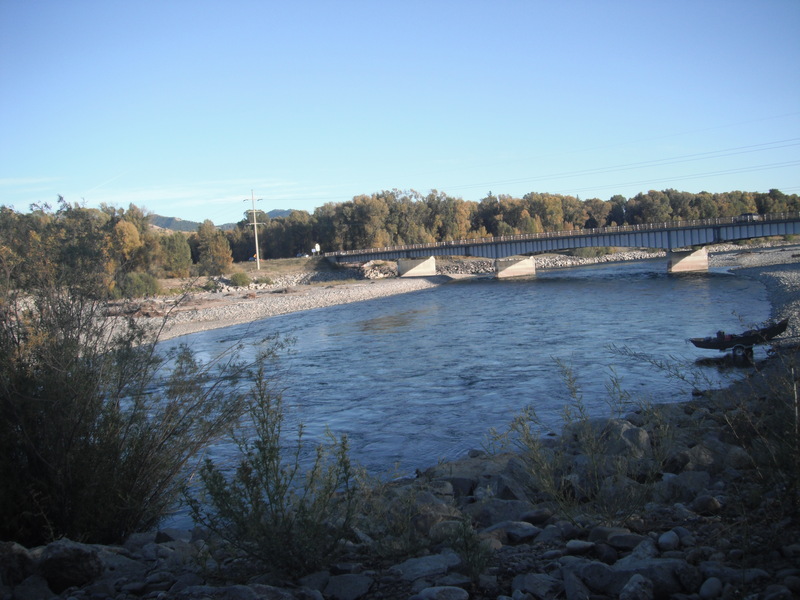 The Snake River follows the road coming towards Jackson and then Jackson Hole. We stopped and took some pictures of the view but hope to do more when we travel back to Salt Lake City on Friday. Well, it is very interesting as we are staying in a Hostel. Definitely was a culture shock and I laughed as I could hear my father saying, “Well, Chris, looks like you are roughing it.” We talked the girl at the desk in allowing us to be on the 2nd floor instead of the 4th as our bags are so heavy with the extra layers of clothing. Of course, my luggage lost one of its wheels so it has been fun lugging it around. We are in what is called a private Quad Room and the price was affordable as everything is very expensive here. After we settled in this evening, it seems exactly what we are supposed to be experiencing. 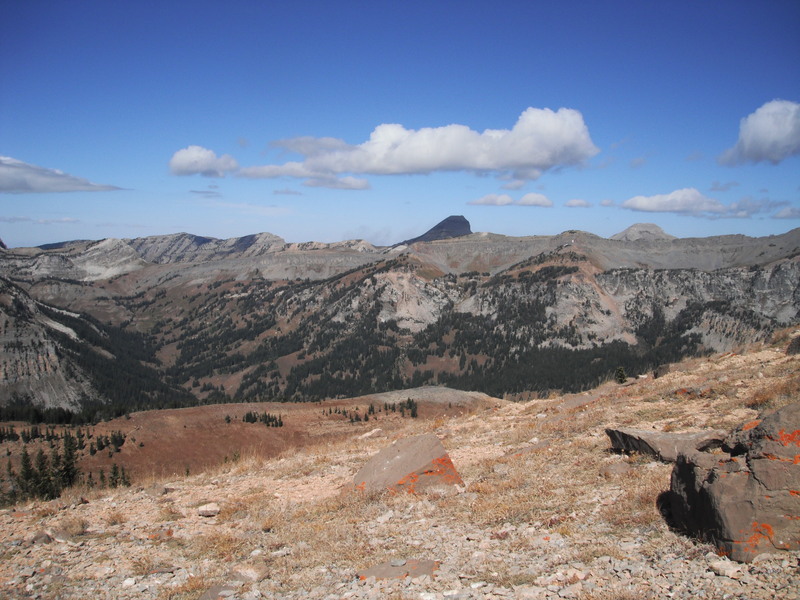 This trip is not about being in wonderful accommodations but being out hiking and communing with the energies. “We definitely won’t be spending much time in the room,” is our standing joke presently. After we moved all our belongings into our new space for the week, we traveled back down Route 390 to find a spot to open up the energies. The front desk clerk shared with us a perfect spot and said, “I am getting chilly bumps”. She seems very enlightened and works in a local organic restaurant which we definitely will be trying. We traveled about six miles down the road and found the gravel entrance to where people transport their boats to go into Snake River. We happened to find a great spot with a bench overlooking the river. This bench was donated in memory of “Joseph Joe Allen” and we thought it was great we found such a wonderful spot. I am sure his soul was with us on such a wonderful moment. 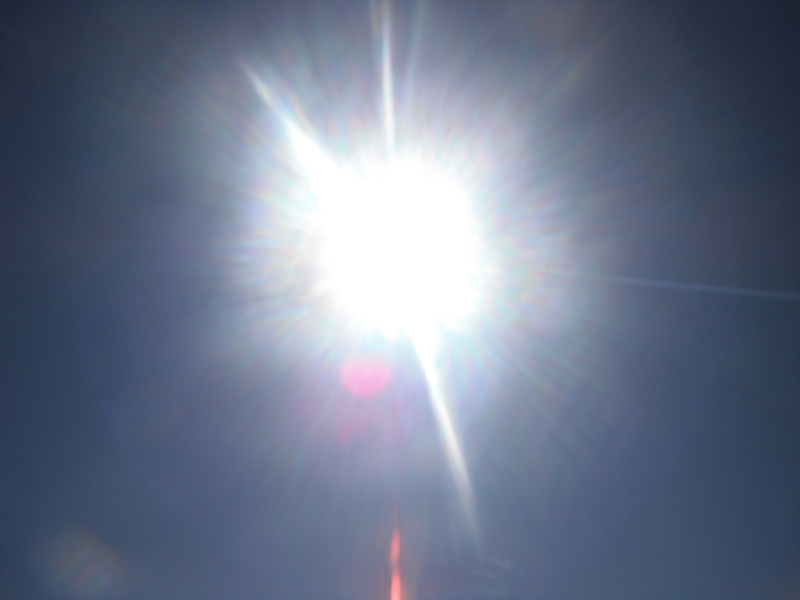 We opened up the ceremony by connecting with the Native American energies and the Spiritual Hierarchy including Lord Melchizedek, Lord Metatron, and the Mahatma overlighted by Divine Mother and Father God and the Creative Source of All That Is. Masters Conficius and Lanto are our leaders during this expedition along with all of the Ray Chohans, Elohim Councils of God, and Archangels of the Rays of God. We stated everyone’s names and asked anyone to be included that read the blogs, or put out their intention to be here with us. I definitely felt the energies change greatly and hope each of you intend to travel to the Mountain Retreat this week. As we were watching the river, it was so beautiful as the moon was shining above. It was pre-sunset and the view is spectacular. We were talking that possibly we needed to get into the water this week and noticed a young man starting to go in the river for a swim. Now we are up on a hill looking down about 200 yards. The current was very strong, and we were wondering how cold the water must feel. We waited for him as he swam several feet towards a winding point and got out of the water. It also looked very deep. He did this a couple of times. When he and his lady friend, came up to the parking lot we asked him how cold it was. His friend said, “It is freezing.” We mentioned we were thinking of getting into the water this week and she replied, “High noon would be the best time.” That is exactly what we had discussed. We shall see how brave we really get. We were thinking that possibly wearing a thin pair of pants for comfort. You never know what happens to us on these trips and Spirit loves to get us to challenge ourselves. I will keep you posted. We left the area and really felt the adventure had started. Sometimes it just feels like you are in a dream just as I did in Mount Shasta. Now the reality has set in. We came back to our cabin-type room and totally cleansed the energies with the Golden Light, Sacred Space Spray that I make, and some clearing salt. Wow, our hands were so black and I was hearing some lost energies asking where the Light was. It feels so much better now. We have set up the ascension columns in the space and are ready to sleep wonderfully as we travel to the retreat this evening. Please join us for to experience the amazing energies. We are off tomorrow to check out the TRAM up the mountain (it saves us a 7.1 mile hike). We lucked out – it is still open for another week and I think it is going to be amazing. Not sure where we are hiking or where we will be guided to do the ceremony for tomorrow but I will share as much of it as I can.